The magician displays four jumbo (2 1/4") Chinese coins to the audience and offers to give an example of how well the Chinese economy system works. He clearly places one of the coins into his pocket and closes his hand around the remaining cards. When he opens his hand, he still has four coins! This is repeated several times and then things get out of control: one of the coins vanishes and reappears in the magician's wallet, two coins placed on the table multiply into four coins, two coins travel through the performance mat and to finish both sides of four coins are clearly shown, yet they multiply into eight coins! 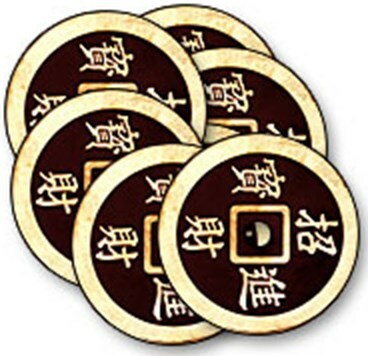 Includes seven jumbo Chinese coins, six special gimmicks and instructions.